Today the company clearly appears much different from the past; development in terms of billings, but above all the move to the new headquarters, have allowed better organization and a clearer division of tasks and duties among personnel, as well as the optimization of time use, and a more sensible rationalization of costs. 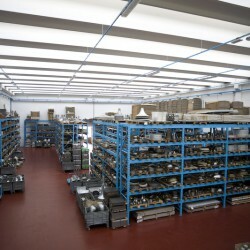 Fundamental to this goal is the possibility to archive the dies and other tools used in the production process in a single warehouse of about 1,000 square meters, dedicated exclusively to this purpose. In addition, greater importance than in the past has been given to the use of computerized instruments in the creation of projects and designs useful in the production phase of the dies.